Last time we talked about barriers parents face when choosing a DIR/Floortime® intervention for their child with developmental delays. One barrier we didn’t discuss was grief. Especially early on, parents can be completely overwhelmed by the grief that accompanies a new diagnosis or birth of a child with special needs. When grief hits, it can be completely immobilising. When spouses deal with grief differently, this can be an added stress on top of each one’s own individual experience of grief. For some, the stress becomes unbearable. At this point, not only are the parents in need of help and support, but the child might be at risk: if not physically, then certainly emotionally. DISCLAIMER: By no means is this blog post suggesting that having a special needs child is cause for grief. It simply brings to light the experience of grief that many parents often feel when learning that their child has special needs. Certainly not all parents feel this way, and certainly parents who might feel this way at some point often come to feel very differently. This blog post is for informational purposes only and does not intend to give specific advice nor consultation to individuals. Some parents might experience depression–a sense of helplessness and hopelessness. Others might experience anger over what they feel is unfair. Why did this happen to us? Why does our child have so many challenges that other children don’t have? How can I possibly ever cope with this? This was not the way it was supposed to happen! Certainly all will worry. How will we provide our child with the support (s)he requires? Who will have to quit working to stay at home full time? Who will help us if we can’t afford to stop working? Whenever we feel there is something that could have happened differently, we have unresolved feelings that simmer. We can try to manage these feelings but really that is just another way to bury them. They will just eat away at you until they come out inappropriately. Some parents may inadvertently take things out on their child, their spouse, or others trying to offer support in their life. Unresolved grief cannot be managed. Our emotions are signals to us that we need to listen to. Just like we need to make room for all of our children’s emotional expressions, so too do we need to allow ourselves the freedom to feel our own emotions without judgment. Developmental psychologist, Dr. Gordon Neufeld calls this process adaptation. In order to adapt, you must come to terms with the futility that there is nothing left for you to do but cry about that which you cannot change. Whether crying physically, or experiencing that felt sadness that really sinks in, we are designed as human beings to adapt after having our tears. Of course you cannot have tears over that which you cannot change if you are still unwilling to accept that which is futile. In this case, you have unresolved feelings that simmer in a traffic circle of frustration. You also cannot adapt if you have become numb to your feelings in the first place. The Grief Recovery Method® is a series of steps one can take towards resolution. In completing your unresolved grief, usually you will find out that a number of resentments and anger have been carried forward from the past which cause the current feelings of despair. You start by simply listing all of your memories of experiencing grief or disappointment with someone. Through the steps that follow, you will be surprised at what becomes uncovered and has been repeated in your life that has created this backdrop for the grief you feel now. You will dispel myths around the grief you felt when something significant changed in your life. It helps you list behaviours you’ve used to cope with these feelings, and to uncover the untrue beliefs you may have carried forward. For instance, if you ever had someone in your life around whom you felt you don’t measure up for some reason, having a child with special needs can trigger those feelings of inadequacy. This could mean you became competitive with others and now you feel you’ve lost. It could mean that you became determined to always succeed, and now you’ve failed. It could mean that you put all of your expectations for your future happiness into the perfect family you would have, and now your family isn’t perfect. It could be that you were unable to fulfil a dream you had and so you wished that dream for your child, which you now think is impossible. It could be that you have aimed to please your entire life, and now those around you aren’t happy with a child who isn’t neurotypical so you’ve let them down. Again, the list goes on and will differ for each person who takes the steps to resolve the incomplete feelings. But you don’t even have to figure out these revelations yourself. The Grief Recovery Method® makes the process so straight forward, the resolution just happens. Finally, the action steps you take lead you to ‘clear the air‘ and move forward. Many grief processes out there are just different forms of managing grief, but the Grief Recovery Method® really helps resolve it immediately. For me, it was anger that was holding me back. I completed the Grief Recovery Method® and was so convinced by its effectiveness for everyone, that I became a Certified Grief Recovery Specialist®. The method showed me that anger resolution would be much more sustainable than anger management, which isn’t ever really possible for the reasons stated above. This past fall I helped a group of mothers with special needs children complete their grief. Many of them also had experienced anger. They found the action-based education program very helpful in moving forward. I would be happy to answer any questions you might have about taking these steps yourself. Very powerful. Thank you for these insights! Wonderful article. Beautifully expressed and full of insights. 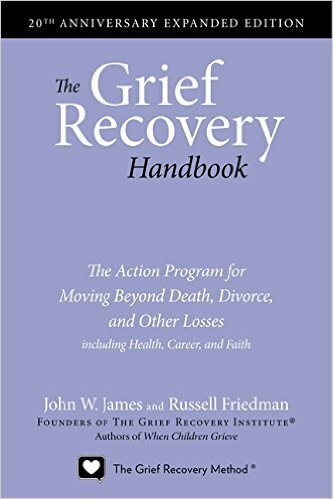 I too am a huge fan of the Grief Recovery Method.